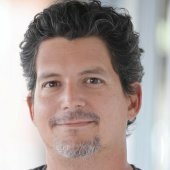 As new technology and techniques for marketing are developed, it’s important for business owners to continually review their practices to make sure they’re getting the best investment for their marketing dollar. Though email marketing has been around for decades, research has shown that it remains one of the best values for marketers. Experian recently released their 2nd Quarter Email Benchmark Report, and it shows email marketing is growing and provides tips on improving click through rates. One of the benefits of email marketing is that though it’s technically a mass marketing method, it can still being highly personalized. 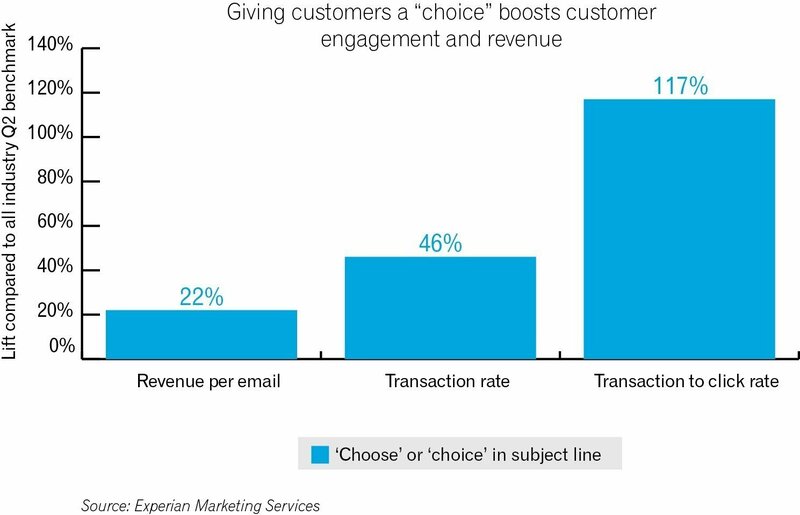 This may be why Experian found that email subjects that gave the reader the impression of a choice they can make performed well. 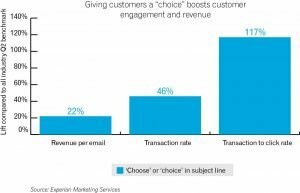 The researcher data shows that email campaigns using the words “choice” or “choose” in the subject line are driving substantially higher engagement and revenue rates than average. The benefit of using words like “choice” or “choose” in email subject lines is quite significant and represents a huge boost for a change that costs no money to implement. As detailed in Experian Marketing Services’ Q2 2015 Email Benchmark Report, email campaigns with these words drove 22 percent higher revenue per email, a 46 percent increase in transaction rates and a 117 percent increase in transaction-to-click rates. The report also found evidence that more people are getting and clicking on email messages. Email volume rose by 16.1 percent in Q2 2015 compared to Q2 2014, yet response rates stayed fairly constant. This shows the increase in email isn’t being driven by spam, and that as the amount of email people receive increases, they find just as many things worth opening as in the past. This report has a lot of good information and is worth reading. A complimentary download of the full report is available for business owners and marketers. For more information about email marketing, read this article on another recent study on email.